Other watercooling parts from this loop including water blocks and Kryoconnect 3 slot bridge also listed for sale. EKWB EK water cooling Predator block GTX 1080 FTW Backplate. Black/Nickel and Black backplate. Part of EKs Predator quick connect series. I believe this also fits the 1070 FTW. All new and never used only opened boxes to check contents. All accessories included. Bought for a rebuild of my existing loop but never got around to installing. Thanks for looking. For sale two Water Blocks for LGA 3647 Square. On the base of one of them there´s a very very tiny chip, inside red circle on pictures. Price is per Water Block. EK-FC980 GTX is a high performance full-cover water block for nVidia reference (NVA-1G401) design GeForce GTX 980 series graphics cards. EK-FC980 GTX water block features a central inlet split-flow cooling engine design for best possible cooling performance, which also works flawlessly with reversed water flow without adversely affecting the cooling performance. Standard M4 mounting threads. Industry standard Black Ice® quality. Air Cooling. Water Cooling. radiator shown with optional push fittings. Custom Black Carbon high quality finish. One which clearly has space for the UK's largest Watercooling supplier. GTX 680 FTW EVGA waterblock from EKWB. This product is provided for those who wish to install it into 3rd-party chassis. 12 Tube G1/4 Copper PC Computer Water Cooling Cooler Liquid Radiator Heatsink. Made of high grade copper, antioxidant and durable. Material: Copper. 1 Radiator. 4 or 8 or 12 or 16 Long Screw. 4 or 8 or 12 or 16 Short Screw. EK-FC1080 GTX Ti Strix Backplate is a CNC machined retention backplate made from black anodized aluminum for EK-FC1080 GTX Ti Strix series water blocks. all you see is what you will get ! the pictures are of the actual item. 1 x Water Cooling. Large capacity of water, beautiful appearance of the atmosphere. Especially for the tower, the tower above the use of the chassis. Connector: Top 3 holes. Detail Image. The 240mm radiator and dual SP120L PWM fans provide the excellent heat dissipation you need for highly overclocked CPUs. Corsair Link is built in, so you can monitor temperatures, adjust cooling performance and customize LED lighting directly from your desktop. 10k sensor, 2-Pin plug, easy to use. Notes: The real color of the item may be slightly different from the pictures shown on website caused by many factors such as brightness of your monitor and light brightness. 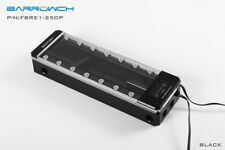 The "Lighttower" effect creates an astounding visual experience within every watercooling system. The Eisbecher supports this in two different ways: fluid coming from the bottom and coming from the top. Fans: 92mm. Fit both liquid and dual fans easily and snugly over the CPU, sending liquid and air to the motherboard's core and its surrounding components. Liquid and Air - single tower utilizes superior AIO liquid cooling with Dual fans for area cooling. 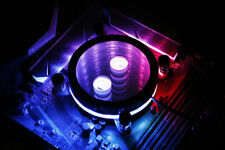 MasterFan Pro RGB series provides a specific air cooling solution ideally for CPU coolers and chassis in-take fans. The MasterFan RGB Pro series is fitted with multiple layers of our exclusive noise reduction technologies and a perfect blend of fan blade design that put together work in harmony to cool your entire case and its components in silence. Hence the radiator can even be installed in tight enclosures, where otherwise internal installation is not a possibility. The threaded opening can even be used for filling, e.g. in combination with a Fillport. Water reservoir height: about 200mm. Liquid cooling simply works better than air cooling and the special design makes it easy for you to protect your valuable CPU. Cylindrical Water Reservoir: The cylindrical water reservoir is manufactured from high quality transparent acrylic so that the circulation system is visible. XSPC Reservoir Pump Combo X20 750 5.25" Dual Bay 750lph. Raystorm CPU cooler. Alphacool NexXxoS XT45 Full Copper 280mm Radiator 2x140mm fans new unboxed abandoned project. Material internal: Mostly copper. Material casing: Side panels steel, threads brass, copper chambers. Colour: Black. Liquid cooling simply works better than air cooling and the special design makes it easy for you to protect your valuable CPU. CPU Cold Head: The CPU Cold Head is constructed with a copper base to provide exceptional heat transfer and cooling performance. Aquacool ACFC-EVGA1060. ACFC-EVGA1060 is a high performance, copper full cover block made in EU for EVGA GTX 1060 graphics cards. With precision CNC processing and simple construction, the block using large flow design and a weak or silent pump can be used as well. 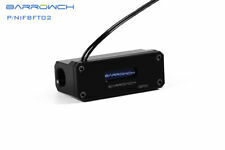 Thermaltake Pacific Temperature Sensor detects coolant temperatures ranging from 0°C to 99°C (32°F -210°F) and displays the value in unit Celsius or Fahrenheit. Thermaltake Pacific Temperature Sensor. Alphacool eisblock Gpx-n Plexi Light Rtx 2080ti. Condition is Used. Dispatched with Royal Mail 1st Class.